On July 28, 1821, the great South American liberator José de San Martín proclaimed the independence of Peru from Spanish colonial rule. At the time, the fledgling Republic of Peru was flying a flag introduced by San Martín in October 1820. The flag was quartered diagonally to form four triangles, with the upper and lower sections colored white and the lateral sections colored red. The flag featured a crest at its center depicting an Inti-style sun rising up behind three snow-capped mountains. According to Peruvian writer Abraham Valdelomar, San Martín chose the red and white colors after having witnessed parihuanas—flamingos with red wings and white chests—along the southern coast of Peru. A more prosaic but perhaps more realistic reason behind the color selection would be a mirroring of the former flag of the Viceroyalty of Peru (the Spanish Cross of Burgundy), which featured a red saltire, or diagonal cross, on a white background. Going forward, the use of red and white would be a consistent theme in every new version of the Peruvian flag. In 1822, José Bernardo de Tagle, then provisional President of Peru, introduced a new flag in the form of a horizontal triband: a white band between two red bands with a golden sun at the center. On the battlefield, however, the new flag was found to be too similar to that of Spain. It was quickly replaced by a vertical triband featuring a white band between two red bands, again with an Inti-style sun at the center. Another great liberator, Simón Bolívar, introduced a fourth and final design (as used today) on February 25, 1825. This flag used the same vertical triband design as introduced by José Bernardo de Tagle, but with the Peruvian coat of arms replacing the central sun. Today’s flag of Peru has three principal variants, all of which are shown and explained in the following three pages. The only difference between the flags is the inclusion or not of a coat of arms, depending on usage. Peruvian laws regarding the national flag do not define exact color tones for the red and white bands (the red is approximately Pantone 186C, or C3182B in HTML color, while the white is pure white, or FFFFFF). Peru has an official flag day on June 7, a date that also marks the anniversary of the Battle of Arica. The national flag of Peru (bandera nacional) is the standard flag of the Peruvian people. Unlike the state and war flags, it is a simple red and white vertical triband with no shield or coat of arms at its center. 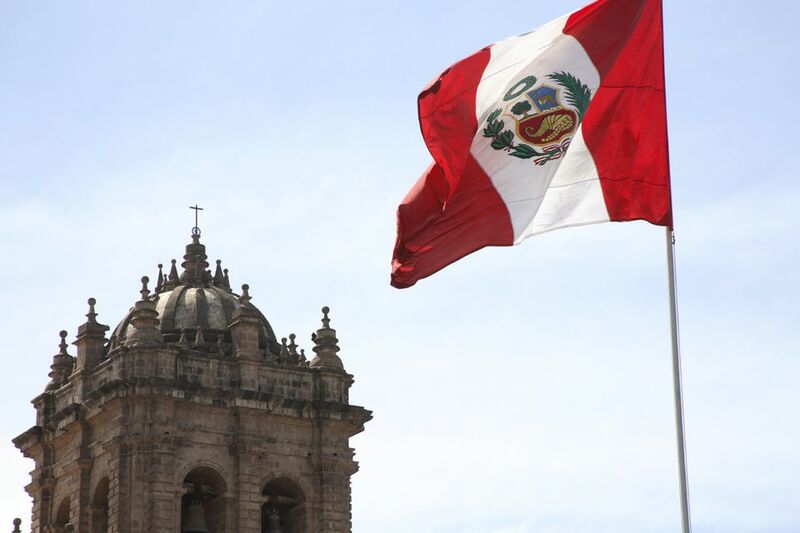 During Peruvian Independence Day and the fiestas patrias, Peruvian citizens are obliged by law to fly the national flag from their homes (Law 8916 states that every home must fly the flag from July 27 to July 30). Further decrees inform citizens as to the material used to make the flag, the nature of the flagpole and the required dimensions of the flag in relation to the size of the building from which it will be flown. Local authorities can fine citizens who do not fly the flag during the specified time (it’s no surprise, therefore, that the flag is flown everywhere during the fiestas patrias). The state flag of Peru (known as the pabellón nacional) is the same as the national flag but with the addition of the Peruvian coat of arms (escudo de armas) at its center. The coat of arms features a vicuña, a cinchona tree (the source of quinine), and a coin-filled cornucopia (the same coat of arms appears on Peruvian currency). The state flag is flown “exclusively in buildings occupied by Powers of the State,” including the Armed Forces and National Police of Peru. The flag must be flown from all state buildings from 8:00 am until 6:00 pm every day. The war flag of Peru (bandera de guerra) is similar to the state flag but features the Peruvian national shield (escudo nacional) instead of the coat of arms. The shield and coat of arms are almost the same, but the national shield has a Peruvian flag on each side rather than a palm branch and laurel. As determined by Supreme Decree, “the use of the flag of war is obligatory in bodies or units of the Armed Forces and National Police.” Specific units are allowed to inscribe their service, name, and number below the national shield on their own flag.